Archie tells Veronica that he loves her. Archie scrambles out of the room after it becomes uncomfortable. Jughead goes digging into the past about "The Riverdale Reaper." The truck driver was truthful about the crime. Jughead shows her a newspaper from the past; Betty recognizes it as the house The Black Hood sent her. FP is being released from prison. Jughead and Betty ask Veronica and Archie to followup on a clue about The Black Hood while Bughead goes to pickup FP. Cheryl gives Josie a back rub in the locker room. The janitor pops in a breaks it up. Sheriff Keller visits the Lodges about a letter sent by The Black Hood. The letter threatens them about being sinners. Other families in Riverdale got the same letter. The Lodges want Archie around more to protect them. Betty asks Alice to give Jughead the benefit of the doubt. Tall Boy disapproves of Jughead wanting to work with Mayor McCoy to fix Southside. The Serpents place it to a vote and Jughead wins. Archie wants to talk about what happened, but Veronica brushes it off. FP decides he's not going back to the Southside Serpents. He plans to work at Pop Tate's to make some money. Sheriff Keller sends Veronica and Archie to take with the late Sheriff Howard's daughter to talk about the case. Archie thinks they need to go to the house. FP wants Jughead to give up on the Southside Serpents. He wants to quite too. Reggie gives Josie a job performing at the car dealership for $5,000. Cheryl gets upsets and tips over a milkshake to make FP clean it. Penny calls Jughead to come to the diner or else she'll send FP back to prison. She threatens him again, but he refuses. She threatens to go after Betty if he doesn't help. He walks away. Archie and Veronica go through the original crime scene of The Riverdale Reaper. They find the Sheriff's files at the house. The notes reveal the original victims were a family of five. 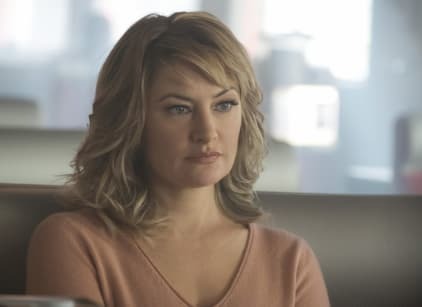 Alice goes to FP to beg him to stop Betty from joining the Southside Serpents. Archie and Veronica sift through old yearbooks to find the surviving child of the massacre. 'Joseph Conway' turns out to be the school's janitor. He found his justice by condemning the man who killed his family. Archie confirms the janitor is not the killer. Veronica realizes her mother has never said 'I love you' to her father. Alice relives her Serpent ways at the bar. Archie tells Veronica it's fine that she didn't say 'I love you.' However, there's still tension between them. They sing a cover of "Mad World" at the bar. Veronica gets upset and runs out of the bar. FP decides he's not retiring from the gang. He says that Jughead broke his heart because now he has to stay in the gang to make sure Jughead is free. Veronica tells Archie she can't be on the same love level as him. Jughead ends things with Betty so that he doesn't pull her down too. Archie stares out at Betty and starts to have an interest in her.